Electroencephalography (EEG) is a neurological diagnostic procedure that records the changes in electrical potentials ( brain waves) in various parts of the brain. The EEG is an important aid in the diagnosis and management of epilepsy and other seizure disorders, as well as in the diagnosis of brain damage related to trauma and diseases such as strokes, tumors, encephalitis, and drug and alcohol intoxication. The EEG is also useful in monitoring brain wave activity and in the determination of brain death. Research is active in determining the role of EEG in the diagnosis and management of mental retardation , sleep disorders , degenerative diseases such as Alzheimer's disease and Parkinson's disease, and in certain mental disorders such as autism and schizophrenia . The EEG should be administered, monitored, and interpreted only by a specially trained health professional. It is important to recognize that diagnosis should not be based on the EEG alone—the EEG represents an adjunct to the neurological history, examination, and other specialized studies. The EEG is an extremely sensitive instrument, and tracings can be greatly influenced by the actions and the physiologic status of the patient. It is important that the patient be properly prepared physically and psychologically in order to obtain an accurate and reliable record. Medications such as anticonvulsants, tranquilizers, stimulants—including coffee, tea, cola drinks—and alcohol should be withheld for at least 24–48 hours prior to the test. Inasmuch as hypoglycemia affects brain wave patterns, the patient is told not to withhold any meals. Brain function is associated with electrical activity, which is always accompanied by an electrical field. This field consists of two parts, the electrical field and the magnetic field, and is called an electromagnetic field. The electrical field is measured by surface electrodes and is recorded by the electroencephalogram. Prior to the recording session, approximately 16–20 electrodes are attached to the patient's scalp with a conductive washable paste, or collodion. Depending on the purpose of the EEG, implantable needle electrodes may be utilized, in which case the patient should be informed that there will be mild discomfort. The patient lies on a bed, padded table, or comfortable reclining chair and is asked to remain quiet and relaxed during the approximately one hour that is usually required. A sleep recording up to three hours in duration is usually obtained if the diagnosis is a seizure disorder. Under certain conditions, various stimuli such as flashing lights or deep breathing may be utilized. In an ambulatory EEG recording, the patient is attached to a portable cassette recorder and goes about regular activities, usually for up to 24 hours. 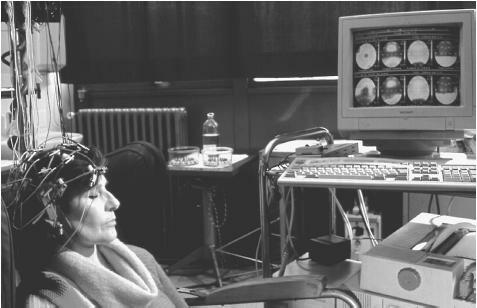 Magnetoencephalography, a supplement to EEG, also uses an electroencephalogram to measure the patient's electrical field. In addition, however, the patient's magnetic field is also recorded to measure electrical activity. Every electrical current generates a magnetic field. The magnetic field is detected by an instrument called a biomagnetometer and recorded as a magnetoencephalograph (MEG). The information provided by the MEG is entirely different from that provided by computed tomography (CT), topographic encephalography, or magnetic resonance imaging (MRI)—imaging instruments that provide still, structural, and anatomical information. The information recorded by the MEG provides important supplemental information to that recorded by the encephalogram and, used together and conjointly, they both provide a much more complete and comprehensive idea of cerebral events. Using MEG, the brain can be observed "in action" rather than just being viewed as a still image. Magnetoencephalography has been used to map the sensory and motor cortices of the brain, to determine the organization of the auditory center of the brain, and to study cognitive functions such as speech, memory, attention and consciousness. This information is critical for neurosurgical planning such as the removal of brain lesions. Thus, preoperative MEG is valuable in planning the surgical treatment of tumors and malformations. MEG can provide surgeons with real-time computer-generated images of deep-seated lesions that are essential before surgery. The quantitative EEG is also known by the acronym BEAM (brain electrical activity mapping). Prior to the EEG, the patient is given full instructions in the procedure, particularly about the avoidance of certain medications and food. In cases where a sleep EEG is anticipated, the patient may be requested to minimize sleep or stay awake the night before the procedure. Sedatives to induce sleep should be avoided, if possible. No specific procedures or aftercare are required. Patients are advised to resume their usual activities, especially the resumption of medications that had been temporarily discontinued. This woman is undergoing an electroencephalogram (EEG) to diagnose Alzheimer's disease. On the computer screen at the right are the colored scans of the electrical activity in her brain. Alzheimer's patients show a specific abnormality in their EEGs. temporary discontinuation of anticonvulsant medication or from the provocation of a seizure by an epileptogenic stimulus such as flashing lights or deep breathing. Although the provocation of a seizure may serve to substantiate the diagnosis, all potential seizure patients should be carefully monitored to avoid injury in case a seizure does result. Alpha waves: Most of the recorded waves in a normal adult's EEG are the occipital alpha waves, which are best obtained from the back of the head when the subject is resting quietly with the eyes closed but not asleep. These waves, occurring typically in a pattern of eight to 13 cycles per second, are blocked by excitement or by opening the eyes. Beta waves: These waves, obtained from the central and frontal parts of the brain, are closely related to the sensory-motor parts of the brain and are also blocked by opening the eyes. Their frequency is in the range of 8–30 hertz (cycles per second). Delta waves: These are irregular, slow waves of 2–3 hertz and are normally found in deep sleep and in infants and young children. They indicate an abnormality in an awake adult. Theta waves: These are characterized by rhythmic, slow waves of 4–7 hertz. EEG readings of patients with epilepsy or other seizure disorders display bursts, or spikes, of electrical activity. In focal epilepsy, spikes are restricted to one hemisphere of the brain. If spikes are generalized to both hemispheres, multifocal epilepsy may be indicated. Diagnostic brain-wave patterns of other disorders varies widely. The appearance of excess theta waves (four to eight cycles per second) may indicate brain injury. Brain wave patterns in patients with brain disease, mental retardation, and brain injury show overall slowing. A trained medical specialist should interpret EEG results in the context of the patient's medical history and other pertinent medical test results. Niedermeyer, E., and F. Lopes da Silva, eds. Electroencephalography: Basic Principles, Clinical Applications and Related Fields. 3rd ed. Baltimore: Williams and Wilkins, 1993. Restak, Richard M. Brainscapes: An Introduction to What Neuroscience Has Learned About the Structure, Function, and Abilities of the Brain. New York: Hyperion, 1995. Bostwick, J. M., K. L. Philbrick. "The use of electroencephalography in psychiatry of the medically ill." Psychiatric Clinics of North America 25 (2002): 17-25. Blume, W. T. "Invited Review: Clinical and basic neurophysiology of generalized epilepsies." Canadian Journal of Neurological Science. 19 (2002): 6-18. Collins, R., M. Feely. "Practical diagnosis and management of seizures." Practitioner 246 (2002): 188-194. Guillard W. D. "Cortical function in epilepsy." Current Opinions in Neurology 13 (2000): 193-200. Stefan, H. "Pathophysiology of human epilepsy: imaging and physiologic studies." Current Opinions in Neurology 13 (2000):177-181. Paula Anne Ford-Martin, M.A. Ralph Myerson, M.D. Well, data is received in real time. The EEG and MEG has excellent temporal resolution(sampling up to 100 times a second). However, the EEG has horrible spatial resolution because it takes only an average of the voltage from nerve action potentials. Analysis of the data has to take this into account. So the short answer is that reading the data only takes as long as your expertise in reading brainwave data. I'm not as sure for MEG, but that's because I'm not experienced with the data that comes from it. The latest in brain mapping with reasonable trust has been advocated through MEG data analysis system by leveraging Grid technologies, such as Nimrod-G, Gridbus, and Globus. These Grid-based softwares are claimed to remove major problems associated with EEG. However, the problem stands at its origin, namely conclusive solution resulting in real healing to terminally ill paitients, or sufferings. Unless an appropriate instrumentation scheme is designed and tested to make it possible to transfer 'ideal' thought waves ( brain-waves)from a really normal (ideal) person to a patient, we can not trust any of the methods suggested so far for diagnostic and healing purposes. To my mind no such work has been reported aiming towards "thought-transfer' which is of real importance.